There's nothing like a good dollop of German Symphonic Metal to go with your morning cornflakes and Xandria's (thirty-five minute, seven track) "stopgap" EP certainly has the power to wake anyone up and set them up for a hard day at the Playstation. Fans may be in two minds about 'Fire & Ashes'; firstly because there's only three new tracks and secondly because there's a Meat Loaf cover. Yes, Xandria may seem to have scraped the barrel by deciding to cover 'I'd Do Anything For Love (But I Won't Do That)', but it seems fair to shoot the elephant in the room first by saying that I really like it. Dianne van Giersbergen has a superb voice and, for me, injects plenty of passion into what is (in the end) a cracking Jim Steinman song that just got overplayed. Trust me, if this was the first time you'd ever heard it you'd be blown away. As for the three new tracks, 'Voyage Of The Fallen' kicks things off, and it's a full-on fiesta of widdly guitar, Operatic vocals and high drama – exactly what the doctor ordered. To give you a good idea of what to expect, as I write this someone just came up and asked me if it was Nightwish. Second track 'Unembraced' continues along at a fair old pace with the final new song, 'In Remembrance', unsurprisingly slowing things right down and opting for a 'Lord Of The Rings' soundtrack vibe. It's quite a beautiful song even though I do prefer the faster stuff. 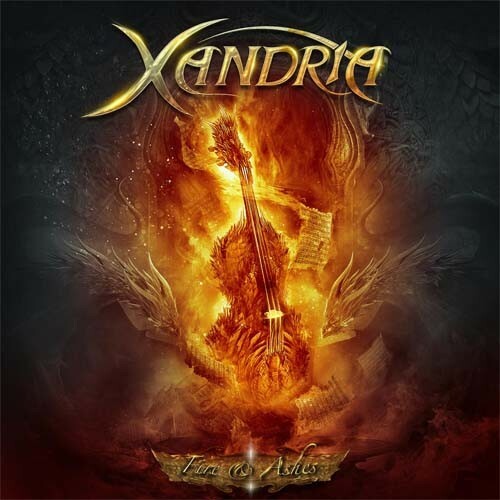 Apart from '...That)', Xandria also deliver a good cover version of 'Don't Say A Word' which was originally by Sonata Arctica. For the uninitiated it's a fast paced Rocker that allows van Giersbergen to really let loose, with the band providing a wonderfully aggressive, crunchy backing. Hearing it sung by a female vocalist really changes the song, and even improves it (ooh...sacrilege, burn the heretic!). The track listing is rounded off with two "remakes" of classic Xandria tracks 'Ravenheart' and 'Now & Forever'. Both are already excellent tracks and there's not much taken or added to the original, even with a different singer. If you're new to the band though, they should make you want to search out the respective albums. Overall, '...Ashes' is certainly worth a few of your hard earned pounds. The three new tracks and two covers are all top notch, with the re-recordings just fleshing out the running order if I'm honest (they don't call me "Honest Al" for nothing). As long as the price is right, there's no real reason not to get this and if you've ever felt curious about Xandria, 'Fire & Ashes' is a perfect introduction.